One of the most frugal things you can do is to buy food in bulk when it’s on sale. But if you don’t have a good way to store that food, it could go to waste. There are plenty of food storage containers and pantry organizers on the market to help make sure that doesn’t happen. But if you’re on a budget, it’s far better to explore some less expensive food storage solutions. Repurpose a container you already have. You may be able to reuse an old peanut butter jar or other glass jars or containers. A few years ago, I recycled an old pretzel container into attractive storage for my flour. You can transform old cans into new storage with items you have around the house. Margerine tubs, pickle jars, plastic potato chip canisters are all candidates for future food storage. Just be sure that the container is food-safe, meaning that it is safe to store food in, and that it has been properly cleaned. Don’t reuse containers that have contained raw meat or go storing your dried beans in an old kitty litter tub, or there may be trouble later! Also, be sure to properly label the new container so that there is no confusing what is inside. This is smart, not only so that you know what you have, but for safety reasons – especially if you have someone with a food allergy digging around in your pantry. Ask your family and friends if they have any containers. Some folks accumulate Tupperware and Rubbermaid in the back of their cupboards and forget about it. Ask them if they have any they could spare. You may be pleasantly surprised. Try Freecycle. Freecycle is a great place to find things you need without spending a dime. Put out a request in your local area and see what happens. Use glass mason jars. Glass mason jars are inexpensive, easy to clean, and last forever (if you don’t drop them!). You can even vacuum pack snacks and other items to extend their shelf life with the FoodSaver Wide-Mouth Jar Sealer . Shop at the dollar store. Stores like the Dollar Tree often have some great food storage containers for just $1.00 each. Garage sales and thrift stores. 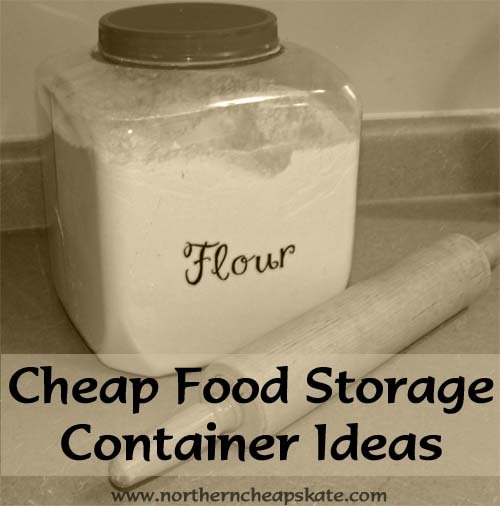 You can usually find some food storage containers at garage sales for less than a buck. And thrift stores usually have plenty of selection when it comes to food storage options. Estate sales. I love estate sales – a whole household full of stuff to buy! Sometimes you can find entire matching canister sets for just a few dollars. Try eBay. You may be able to find a great deal on food storage on eBay. Just make sure you watch out for outrageous shipping and handling fees or the deal won’t be worth the effort. FoodSaver storage. FoodSaver bags and rolls are a great way to freeze your garden harvest or meat that you’ve bought in bulk. Shop around for the best price and stock up. I have found that the Game food storage bags usually cost less. I’ve also found deals at my local farm & fleet store. Remember: You can reuse any FoodSaver bag that hasn’t had raw meat in it, just wash it thoroughly first. Of course, there are times when you only need short-term food storage, and there are some inexpensive options there. Use the container the item came in. For example, you don’t need a fancy cereal storage container (although, they’re nice to have). Simply make sure that the open bag is rolled tightly and clipped with a clothespin to keep the air out. Use reusable food covers. CoverMate makes reusable food storage covers. Just use, wash, use, and repeat. These are great for things like leftover salads or pasta dishes. Zip-top bags. Zip-top storage bags are great for short-term food storage. Just be sure to look for good sale prices and coupons and stock up when you find a deal. Zip-top bags are also good if you don’t have a lot of freezer space because some items (like pumpkin puree or leftover spaghetti sauce) can be frozen flat and stacked neatly in the freezer. Make sure you combine like items. Perhaps you have a kid (or three) who opens more than one box of something at a time. My kids do this all the time with cereal and crackers. If I find two packages of the same item open, I just combine them into one. I’ve instantly reduced the clutter in my pantry and the likelihood that my children won’t rip apart the pantry looking for it. I personally prefer to use reusable food storage containers. They require a tiny bit more of an investment upfront, but they last longer (years!) and are much better for the environment. They also protect the food better from spoilage or damage (avoid those crushed crackers you pack for snack!). You’ll find that the value of reusable storage containers is greater when you see how it can help with reducing the trash bill. Your turn: How do you store your food on a budget? My labeling system is mostly either stickers I already have or masking tape that I’ve written on! Depending on where you store these, you may want to limit your selections to glass or HEAVY plastic. Should you have a rodent visit you, they can quickly eat through plastic food containers. I put my grocery items that are in plastic in a larger heavy plastic bin. Good advice, Kim! We’ve been fortunate that we have never had a rodent in the house, but that doesn’t mean we couldn’t.